Our IT Service Plans Keep You Connected! IT Service plans by TEKEASE provide unlimited support for your workstations, servers, network, telephone system, and virtually everything in between. We provide the most affordable and reliable IT Service Plans in the industry. 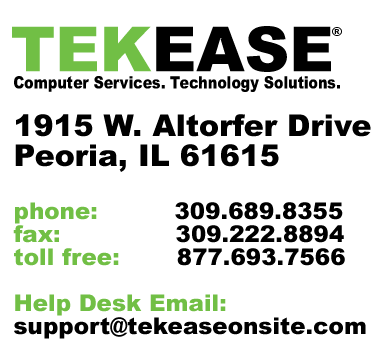 Whether you need computer help, network repair or small business telephone programming or system repairs, TEKEASE ON-SITE is the best choice among technology service companies. Organizations that have a large installed base of older equipment or environments. Organizations with ongoing printer, server and computer repair needs. While on-site Break/Fix Service agreements remove many of the potential problems of managing IT and business equipment, they are particularly useful for these scenarios: TEKEASE ON-SITE offers Unlimited On-site and Online Remote Support Solutions. Unlimited Online Support Plans may be combined with Pay-As-You-Go On-site Services or select a combined unlimited plan for maximum support. We offer per incident support as well as annual contracts and multi-year warranties regardless of where you purchase your equipment. 1 Year – Unlimited On-site & Secure Remote Support 2 Year – Unlimited On-site & Secure Remote Support Small & Medium Business (SMB) Service Plans: Our Network Support Services allow your company to focus on your business objectives by providing relief from the challenges of day-to-day IT functions. From server maintenance to providing support for your end-users, we can handle all of your IT needs. We support all Microsoft Operating Systems and Windows Server 2003 and 2008 versions. All plans require a system baseline. Contact us today to learn more about the advantages offered through our computer help and on-site network repair services. Just give us a call at 1.877.693.7566 or drop us a note with the form below.